Having pulled themselves out of the bottom two relegation zone again after their victory at Romulus last weekend, Rugby Town now face a daunting back-to-back challenge against high flying Witton – starting with a trip to the Cheshire club’s shared Wincham Park stadium on Saturday. Albion – who have lost only three times in the league this season – then visit Rugby the weekend after, with both teams desperate for points for very different reasons. Town’s 3-0 success at Coles Lane lifted them a point above Lougborough and into 20th position, with the Leicestershire club following up on their weekend loss at Stocksbridge with another reverse at home to Stamford on Tuesday evening. With bottom side Northwich also heavily defeated last Saturday, Valley now enjoy a four-point margin over them, although 19th placed Carlton probably dispelled any lingering fears of being dragged back into the fight against the drop after earning four points from their two games over the past week - leaving Rugby Town now ten points adrift. Following their transfer over from the North Division of the Evostik NPL at the end of 2015/16, Witton maintained their excellent form this season with a 5-2 midweek home win over Leek, whilst also stretching their current unbeaten league run to 13 matches (11 wins and two draws) in the process. However Rugby’s opponents this Saturday do still trail leaders Shaw Lane by 11 points, although they have two games in-hand over the Barnsley-based outfit. 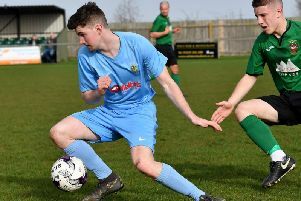 Spalding look secure of a play-off spot in third, with Rushden, Basford, Newcastle and Leek likely to contest the final two places for the end of season knockout competition. Town boss Gary Moran took to social media to praise the efforts of his players last weekend tweeting “Great performance and result from all the squad… Even better to get a clean sheet”, after a brace from leading scorer David Kolodynski and a Ryan Quinn goal saw Rugby ease to their third away victory of the campaign. His latest double means Kolodynski has now notched 14 times from 28 league starts this season, and he has risen to joint eighth in the divisional scoring chart. Town’s line-up at Romulus saw a debut for winger Robbie Parsons, after the ex-Rushden man completed his expected move ahead of the game. Kyle Rowley’s swollen ankle saw him sit out the victory though, with Warren Brooks another to miss out through injury, whilst defender Guy Clark – who had impressed in his first appearance in a Rugby shirt the previous week in the home defeat to Shaw Lane – was also unavailable after he was recalled to play for his parent club Stratford in the Southern League Premier. Callum Burgess and Danny Campbell remain longer term absentees through illness and injury respectively. # Valley’s two main rivals at the foot of the table Northwich and Loughborough face up to each other on Sunday afternoon at the same ground Rugby visit themselves on Saturday. # The club coach to Wincham Park will leave Butlin Road at 11am. For latest information on this, call Tony Mann on 07970 691366.